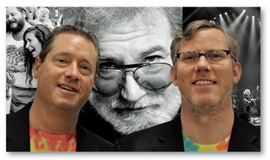 Out next month from Boston authors David Meerman Scott and Brian Halligan is "Marketing Lessons from the Grateful Dead: What Every Business Can Learn from the Most Iconic Band in History." The book's foreword is by Celtics great Bill Walton (a/k/a "Grateful Red"), who attended more than 750 Grateful Dead shows. Halligan, chief executive at the Cambridge marketing software firm HubSpot, says that he and Scott decided to collaborate on the book after reading an Atlantic Monthly article called "Management Secrets of the Grateful Dead," and then creating a 2010 webinar they called "Marketing Lessons from the Grateful Dead." The pair said they started working on the book together just this past April. "The Grateful Dead really created a category — they were a fusion of rock, jazz, and country, with radical improvisation layered on top," says Halligan. "In the book, we talk a lot about their unique business model. Instead of optimizing around selling albums, they made the concert experience the center of the business model. Every concert was unique, instead of the same songs played the same way, night after night. It created a strong incentive to see them over and over. And they let people tape the shows, because they figured that more people would be exposed to their music, which would get more people to pay for concert tickets." Halligan notes that the Dead also created their own mailing list to communicate with fans, asking for addresses at concerts and on album covers, and they sold tickets directly to fans rather than using a ticketing service. Halligan says he hitch-hiked from Brewster, Mass. to his first Grateful Dead show (in Saratoga, New York) while in high school; Scott also saw his first show in high school, in New Haven, Conn. in 1979. Halligan and Scott will appear on HubSpot's weekly video webcast, HubSpot.tv, today at 4 PM to talk about the book. They'll be doing a signing later this month at the Gathering of the Vibes Music and Arts Festival in Connecticut, where Further (featuring Dead members Phil Lesh and Bob Weir) is performing. Other book related-events are listed on Scott's blog. Both Halligan and Scott are advisors to the Grateful Dead Archive at UC/Santa Cruz, assisting with Internet strategy, and they're donating 25 percent of the book's proceeds to the archive.